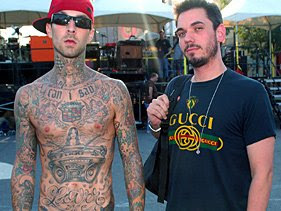 MTV News is reporting that superstar drummer Travis Barker & high profile DJ AM have been involved in a deadly plane crash. Both artists are the sole survivors of a crash that sent their private jet flying off of a Columbia, South Carolina runway. Eye witness reports saw the two men, lit on fire, fleeing from the burning plane and patting each other down. Both artists are being treated for "extensive burns" at the Joseph M. Still Burn Center in Augusta, Georgia. Our prayers go out to families of the crash vitcims who lost their lives in the crash and for a speedy recovery for Travis & AM.